for Hay Hay it’s Donna Day ! My Daughter has a love affair with Shrimp. I have too, but her intensity far surpasses mine. She is the reason I am always trying out different things with Shrimp. 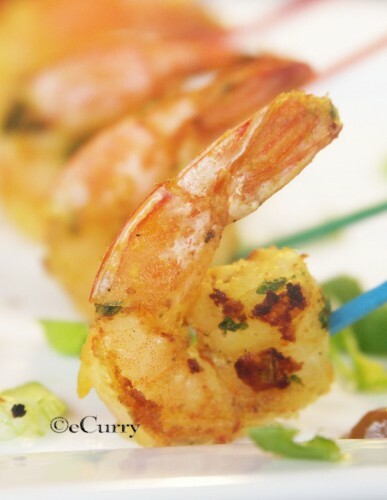 I happen to grill shrimps quite often, and this Satay Shrimp had been a pleasure every time. How nice does it feel, when you see that twinkling eyes shine so bright when she comes back from school & asks, “Whats for dinner, Mama?” & I kid around with her saying all the things that she does not like… see her groan & whine, and then I say… “It’s Shrimp Day for you!” , I say… It is a special treat for her every single time. So when I saw “Satay”, for Hay Hay it’s Donna Day, I knew I had to share this recipe. When I make satay, I give a tiny twist to the marinade/sauce … . My daughter did not like anything to do with peanuts when she was little. So one time I had decided to use Almond instead of using the traditional peanut for the satay sauce. I have used coconut milk as I am so used to the flavor of coconut milk in our Old Bengali Classic “Malaikari” preparation of shrimp. 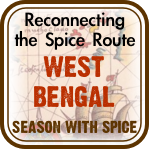 It adds a mild flavor & that just tiny bit of sweet, which is just perfect. It had to be an immediate winner ! Since then I have been using this sauce to grill, – well most of the time. Allow me to call it the Almond Satay Sauce. I did make a Peanut dipping Sauce this time, but the Almond Satay Sauce scored higher as always. I am sharing the recipe for the peanut sauce too. Devein the Shrimps. Shell them fully or whatever way you want it. I have left half the shell on, with the tail… Wash & pat dry. Set aside. Heat 1/2 teaspoon oil. Add the Ginger, Garlic, Sesame Seeds, Cumin & Red Dry Chilli peppers. Fry till the pepper turns a darker shade, & the Garlic starts to turn brown. By this time the ginger will be very fragrant too. Switch off the heat & keep aside. Combine Coconut Milk, Almonds, Salt, Soy Sauce, Turmeric, Sugar, & the above ingredients that you fried in a blender/processor & process till smooth. You might have to pulse it for sometime to get the whole nuts smoothed out. Add the Chopped Coriander/Cilantro to this paste. This is how it looked. Coat the Shrimps in this paste and set aside for an hour or two. 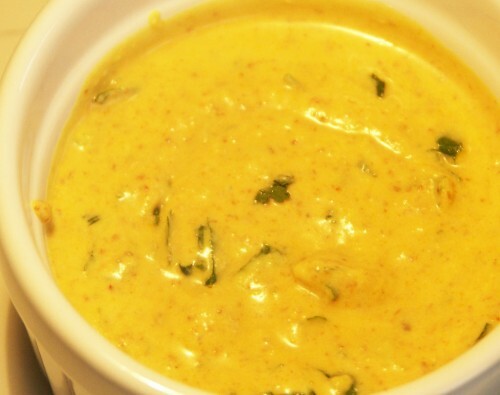 The best thing about this marinade is this could serve as a wonderful dip or a sauce too. Most of the times, I do not make any extra dip for the Satay… just make more of these and use it as a sauce. I have not grilled the shrimps on a grill. Most of the times I just cook them on a skillet. Coat a skillet with oil & heat. Add the shrimps flat on one side and cook on medium heat for about 3-4 minutes. By this they will start turning pink. Drizzle with little bit of oil & quickly turn them over on the other side and cook for another few minutes. At this point increase the heat till you hear a sizzle. The marinade on the shrimp will soon start to brown. 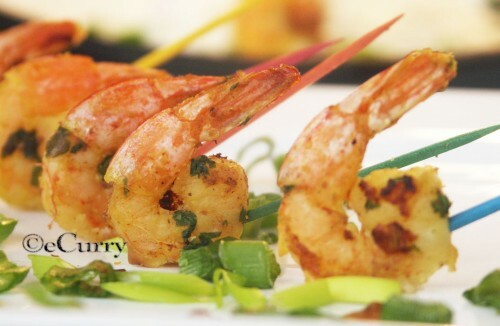 Remove them as soon as the Shrimps have brown spots on them… Do not overcook, a few minutes is all it takes. If left in the pan for too long, the marinade will burn on them and the Shrimps will get dry. Serve with your Favorite dip/Sauce. Alternatively the shrimps may be skewered & cooked on a grill. I just stick toothpicks in the individual Shrimps as they are almost bite size and can be popped in the mouth one at a time. Heat oil in a pan. Add the Ginger, Garlic & the Red Dry chilli. Fry till they all start to get darker and the Ginger fragrant. Switch off the heat. 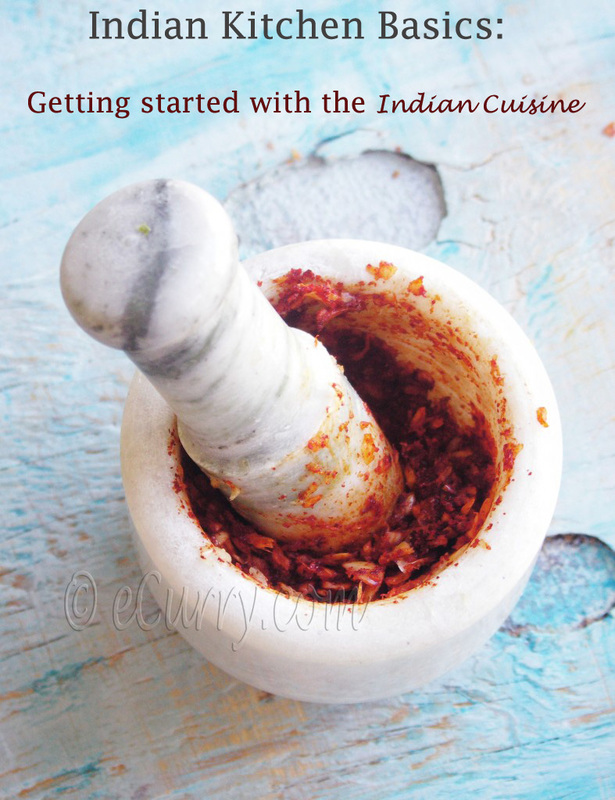 Add all the required ingredients along with the above (ginger, garlic & red dry chilli pepper), & blend/process. Add few spoons of water to the mix to make it a consistency of the dip. Allow it to be a little bit coarse as the crunchy bit taste good. I used 1 teaspoon of dark soy sauce the taste was a bit overwhelming… I have changed the qunatity in the ingredient.. or you could use 1 teaspoon of LIGHT soy sauce. 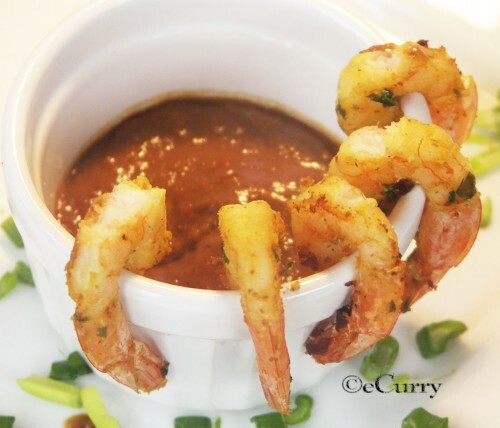 Below is the the Peanut Sauce Served with Satay Shrimp. This Almond Satay Sauce is just perfect with anything… You can use any meat, or any fish, or even Tofu for the vegetarian version of the Satay. I have to say that this Satay Marinade does work better with meat & tofu, since they have a bigger surface & hence one would enjoy more flavors of the marinade. If you ever happen to try this out, I am sure you will Enjoy! Hay Hay it’s Donna Day, hosted my Meeta of What’s for Lunch. Honey? & facilitated by Bron. By the time i came to the end of the post i was drooling all over. It looks so yumm delicious. I love shrimps, but sadly my daughter don’t even touch them. I always tell her to try them, but she never tries. So when ever i make shrimpos for us i have to make something else for her. Like HC! I am drooling! This is a lovely entry Soma! I am so glad you have taken part! WOW! looks so delicious ..chingri khete amader khob bhalo lage , may be will try it out soon ..
Now ! what do I say??? – a feast for the tongue??? a feast for the eye???? This is so rollicking !! Cant put my eyes off those shrimps that are trying to jump into those peanut sauce. Shrimp is something everyone love i guess..and the dish looks so tempting that anyone come here will fall over..yummy yum soma..no wonder why your daughter love this.. 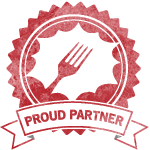 I love your Almond Satay sauce – it sounds amazing! I think my daughter would love this dish too! I love satay and the dip … but have never made it at home .. only when we eat out. Great of you to share this Soma. Shrimp is one of my favorites too. 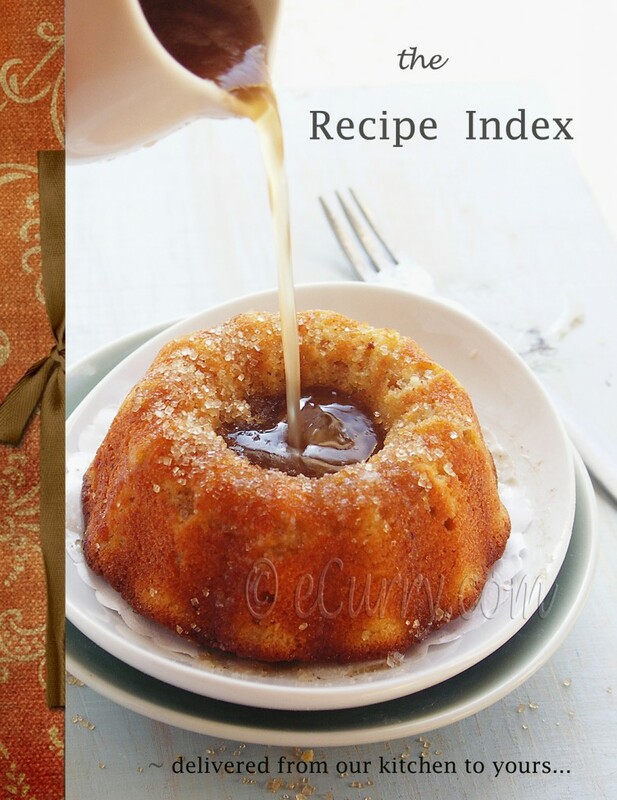 This is a lovely recipe. Thank you! I love your photos of the shrimps! You have a beautiful blog. Thanks for visiting my blog, its nice to ‘discover’ this lovely site. Like so many others I’m drooling over your lovely pictures too! What a wonderful idea to replace peanuts with almonds. Since about a month I know that Rishab is allergic to peanuts, so this is the perfect recipe for me, as me and hubby love satay. 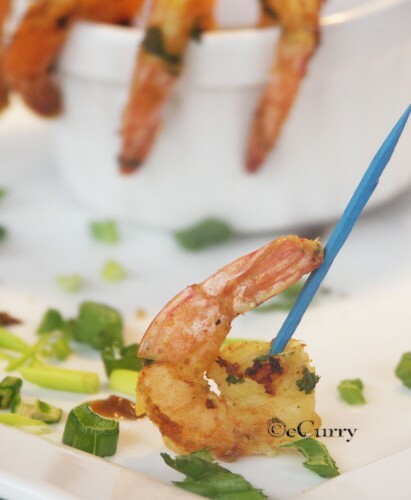 Oh my u make me drool showing so many shrimps all over the page….. Shrimp even steamed I am ready to gulp ! Lovely satay! 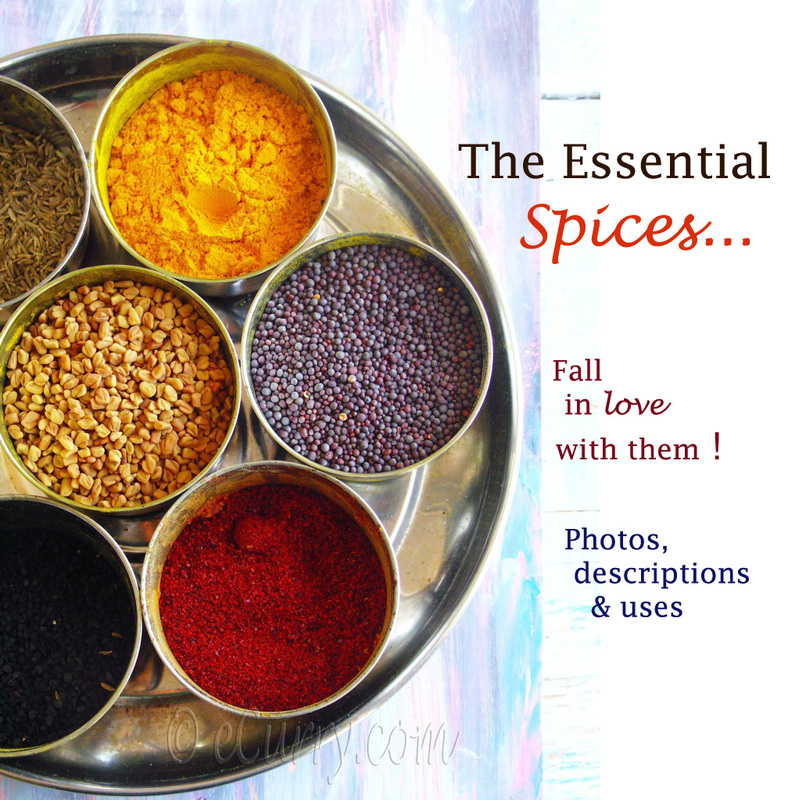 I am vegetarian and yet I loved reading this recipe! Your marinade sauce and dip are amazing, such wonderful flavors. I love shrimps too and I like them spicy! 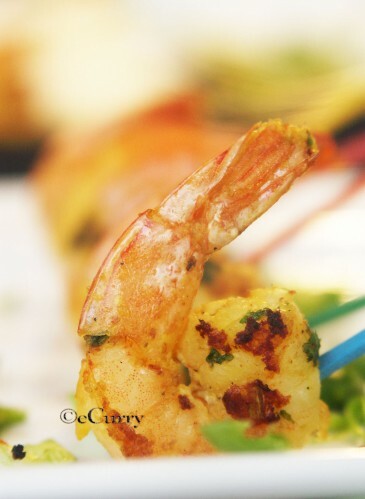 wow Soma…your shrimp satay looks delicious…we love satay…. What an excellent recipe. The shrimps look absolutely divine. Your daughter is a lucky girl. I especially love that you add sesame seed into the sauce. That must give it a special twist. That almond satay sauce sounds great! Thanks all! I hope when if u make the sauce u enjoy as much as we do. iam just returning from WFLH, Congrats on your Big win ! The dish looks absolutely amazing & delish ! Yay! Congrats girl… Those pictures have me drooling here, and what a sauce… This is a must try for me! I used your recipe to make chicken satay tonight and it was amazing. Used a different peanut dip, though, since we’re partial to CPK’s, which is a 50/50 blend of hoisin and PB, with some added spices. Will definitely make again, and may try the shrimp next time!